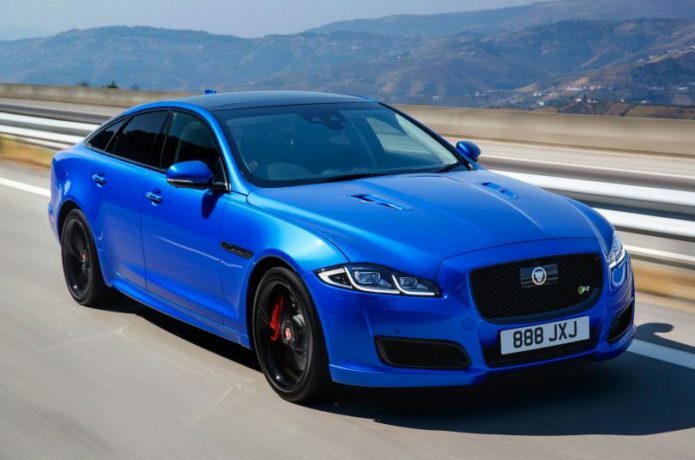 The XJR 575 is the most powerful version of Jaguar’s luxury saloon to date, but can it compete with a raft of more modern competitors? But don’t go thinking that Jaguar has abandoned what it has always been famous for – namely, creating high-powered, luxurious, rear-wheel-drive saloons. First seen in camouflaged guise going up the hill at this year’s Goodwood Festival of Speed, this new (and we use that world very lightly) XJR 575 is the most powerful version of Jaguar’s flagship saloon to date. With BMW, Mercedes and Porsche all producing four-wheel-drive, turbocharged (and, in the Panamera’s case, electrically assisted) super-saloons, the XJR 575 represents the end of a wonderful and wild era. ‘Responsible performance’ is now the order of the day – a memo that Jaguar must have missed, because, instead of taking this opportunity to dial out some of the XJR’s wilder characteristics, it’s simply accentuated them. Like handing Liam Gallagher another pint mid-gig, everything about the XJR has been turned up to 11. Step inside, press the bright red starter button and the supercharged V8 bursts into life with an intensity that is often missing from modern-day turbocharged engines. It’s a real brute of an engine that is absolutely brimming with character; at low speeds, you’re treated to a lovely V8 warble that’s soon joined by a delicious, high-pitched wail from the supercharger as the revs climb. It’s an intoxicating soundtrack that is backed up by prodigious levels of performance. The XJ’s interior is looking a bit dated these days next to newer rivals, but it still has a wonderful ambience. Up front, the diamond-quilted seats (embossed with some questionable ‘575’ branding) come with a wide range of adjustment, and those in the rear are treated to plenty of leg room; there’s little reason to opt for the long-wheelbase variant. The new 10.0in Touch Pro infotainment system is also a vast improvement over the current XJR’s dated touchscreen, with quicker response times and clearer graphics. That said, it still feels a little clumsier and less finessed than Audi’s or BMW’ssystems. The BMW M760Li is faster, the Mercedes-AMG S63 rides better and the Porsche Panamera Turbo is noticeably more economical. And yet, the Jaguar XJR 575 is still a strangely desirable thing. From its raucous supercharged V8 to its rewarding handling, the big Jag delivers a truly engrossing driving experience. But can we truly recommend one? Well, not in good conscience; its rivals are all fundamentally better cars. However, for the handful of buyers who get their hands on a 575, it’s very unlikely that they’ll be disappointed. And, after all, with a limited-run car of this calibre, it’s arguable that its brash nature is its main selling point.